Simply put, the best box set of the year has nothing to do with music. Or singers. Or orchestrations. 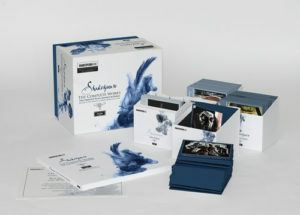 Decca has released Shakespeare: The Complete Works, an unabridged collection of Shakespeare’s 37 plays, performed by The Marlowe Dramatic Society and Professional Players. In addition, there are all of the 154 Sonnets combined with the four narrative poems comes together to create an ultimate collection in one box set. The recordings feature celebrated actors such as Sir John Gielgud, Richard Pasco, Dame Prunella Scales, Sir Ian McKellen, Sir Trevor Nunn, Peggy Ashcroft, Patrick Wymarck and many others. It’s big and heavy and could also serve as a murder weapon. Just in case. The ideal gift for those who want to keep the “Christ” in Christmas. Bill Gaither’s Homecoming Hymns is a true blessing from Time Life. This must-have 10-disc set is packed with 150 inspirational performances, a bonus 20-song CD and a collectible 48-page hymns book with lyrics. 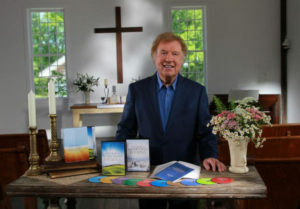 Bonus content also includes extended conversations with Bill and Gloria Gaither, Behind the Scenes featurettes about the “Amazing Grace” and “How Great Thou Art” DVDs, and an exclusive, new interview with Bill talking about hymns. Since his early days with the Bill Gaither Trio, Bill has enjoyed a love of hymns. That love has grown stronger over the years, and these sacred gems have reached new levels of popularity during the last 20 years of Homecoming concerts featuring stars of country and southern gospel music. Time Life invites fans of gospel and Christian music to enjoy an unforgettable collection of the world’s most beautiful hymns personally selected by Bill himself. The tunes are enlivened by guest performers including George Jones, The Oak Ridge Boys, Larry Gatlin, Marty Stuart and Alabama. The set is only available currently through TimeLife.com or by calling 800-950-7887. Since he made his Billboard chart debut in 1964, Hank Williams, Jr. has amassed one of the most prolific catalogs in the history of the music business. 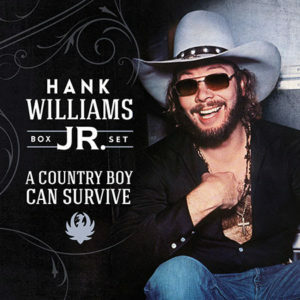 Curb Records now celebrates that legacy with the release of Hank Williams, Jr: A Country Boy Can Survive, a four-disc box set that stands as one of the most comprehensive Williams sets ever released. Focusing on his superstar era that kicked off with 1979’s “Family Tradition,” 29 of his 30 Billboard Top-40 Country hits from 1979-1990 are featured on the collection, which also includes nine of his ten number one hits (including his first 1970’s “All For The Love Of Sunshine,” with The Mike Curb Congregation.) The set also contains fan-favorite album cuts, such as ‘”Outlaw Women,” “Dinosaur,” “The Blues Man” and concert favorite “My Name Is Bocephus,” which originally appeared on his million-selling 1986 set Montana Café. The fourth disc of A Country Boy Can Survive focuses on Williams’ legendary live show, including performances of such classics as “I’m For Love” and “If Heaven Ain’t A Lot Like Dixie,” as well as the iconic title cut–which will celebrate its’ thirty-fifth anniversary in 2017. With the holiday season in full swing, UMe has several new Christmas collections sure to get you in the spirit and to soundtrack all your yuletide festivities. With classics on vinyl, new CD and digital compilations and an official Spotify playlist, there’s truly something for everyone in every format preferred by you or the ones on your good list. The album that started an international movement is now available back on vinyl. Released 29 years ago in 1987, A Very Special Christmas, Vol. 1 brought together some of the biggest musicians of all time for a holiday album to support the Special Olympics and their mission. Founded by David Geffen, the first in the AVSC series featured a who’s who of artists including Bryan Adams, Bon Jovi, Whitney Houston, Madonna, John Cougar Mellencamp, Alison Moyet, Stevie Nicks, The Pointer Sisters, The Pretenders, Run–D.M.C., Bob Seger, Bruce Springsteen, Sting, U2 and The Eurythmics contributing a variety of seasonal staples along with original songs. With their iconic covers by Keith Haring, the A Very Special Christmas album series has become a perennial favorite on the radio and for holiday celebrations over the years. And so the music is flowing, from A to Z, with the emphasis on Z . . . as in “Zappa.” Following this month’s release of three new Frank Zappa albums, the Zappa Family Trust and UMe are continuing their extensive reissue campaign by releasing five iconic works of the musical innovator on vinyl for the first time in decades: Cruising With Ruben & The Jets, Joe’s Garage, Lumpy Gravy, Weasels Ripped My Fleshand We’re Only In It For The Money. 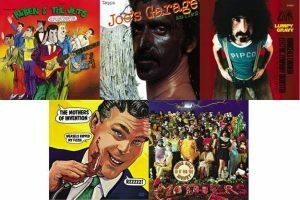 The albums spanning Zappa’s incredibly fertile late ’60s-late ’70s period will be pressed on 180-gram vinyl. Talk about rockin’ around the Christmas tree! 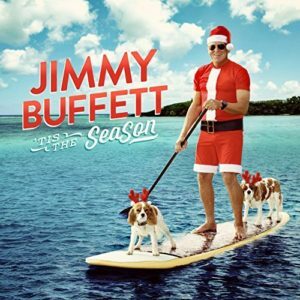 Jimmy Buffett has a brand new Christmas record guaranteed to get you in the holiday mood. Tis The SeaSon, released on Mailboat Records, features many classic Christmas favorites, as well as three new songs written especially for the album. The 13-track record also includes an updated Parrothead version of “The 12 Days Of Christmas.” Be warned. What verve! 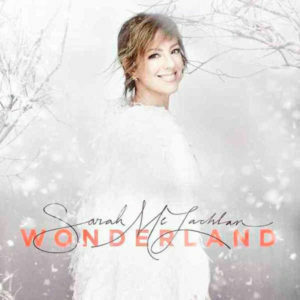 On Sarah McLachlan: Wonderland McLachlan sings classic Christmas songs including Winter Wonderland, O Come All Ye Faithful, Let It Snow, Silver Bells and more. 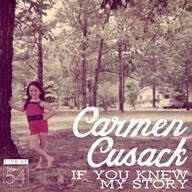 Her signature voice and gorgeous arrangements make this a perfect holiday album. 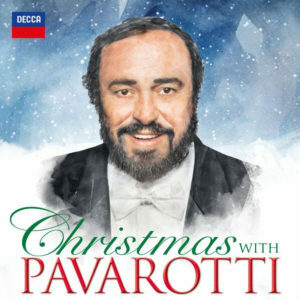 The reissue of the 2-disc Christmas With Pavarotti (Decca) features some of the most beloved Christmas recordings from star tenor Luciano Pavarotti, including “O Holy Night,” “Panis Angelicus,” “Oh Tannenbaum,” among other arias and songs. 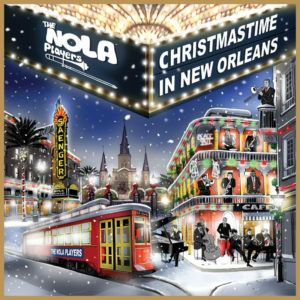 Christmastime in New Orleans is a new album featuring some of the Big Easy’s finest jazz musicians in custom instrumental arrangements of holiday including “Silver Bells” & “Jingle Bells,” the latter given a slinky, finger-snapping treatment like none other. 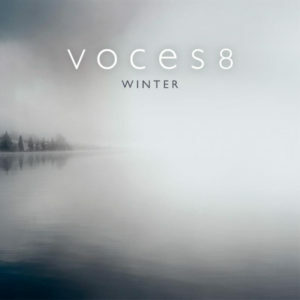 Breaking stereotypical expectations of a ‘seasonal’ album, Voces8’s new Decca release Winter paints a portrait of the season through a sparse and powerful aural landscape, invoking a meditative, inspiring feeling of solitude and union. The CD includes four world premiere recordings, notably a brand new work “Winter”, written exclusively for the album by award-winning composer Rebecca Dale. A film as enigmatic as Nicolas Roeg’s 1976 cult classic The Man Who Fell to Earth is always going to conjure up mysteries in its wake and one of the biggest for the past four decades has been the fate of its much-talked-about soundtrack. Long sought after and highly celebrated by fans, the soundtrack of the David Bowie-starring film, has up until now never been available as a body of work. In celebration of the film’s 40th Anniversary and Studiocanal’s 4K theatrical release, UMe is releasing for the very first time the original movie soundtrack, featuring seminal and original pieces by Stomu Yamash’ta and John Phillips, who composed specifically for the film. The full 25-track soundtrack is available now digitally and on CD. On December 16, a 19-track vinyl edition of the soundtrack featuring just Yamash’ta and Phillips’ score will be released as a double LP. 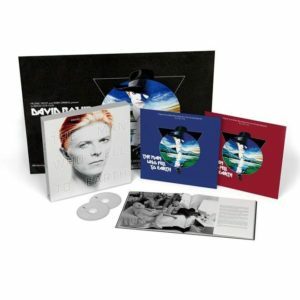 For the collectors, a limited edition dual format deluxe box, which pairs the vinyl and CD releases with a 48-page hardback book with rare photos. Order and stream The Man Who Fell To Earth: UMe.lnk.to/TMWFTE A limited collector’s edition arrives on Blu-ray Combo Pack (plus Digital HD) January 24 from Lionsgate Home DVD. Theatre queens, die-hard fans of show music and those who simply cannot listen, not even for one more second, rap, rock or hip . . . enter Broadway Records. Van Dean is the mastermind behind masterful CDs, especially his series of evenings taped live from Studio 54/Below (which also goes under the name of the highly overrated MF). 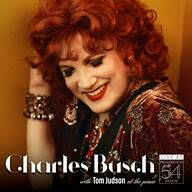 Santa baby, if you cannot bring us the inimitable Charles Busch Tony nominee and drag legend (so brilliant in Auntie Mame), then we’ll take Charles Busch–Live at Feinstein’s/54 Below. On the CD, Busch brings his unique blend of songs both contemporary and from the pas. As our pal, New York Times critic Stephen Holden, raves “He has the gift of comic gab like few other entertainers. Innately funny, endearing and acutely intelligent, he also has claws. For an audience, the possibility of being scratched, although remote, lends his humor a bracing edge.” PS) Charles returns to Feinstein’s/54 Below on New Year’s Eve at 7 p.m. Hey, Santa . 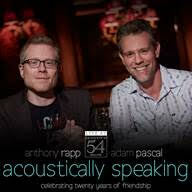 . .
Adam Pascal and Anthony Rapp celebrate their 20-year friendship with Acoustically Speaking: 20 Years of Friendship–Live from Feinstein’s/54 Below. The intimate unplugged show feature songs that have influenced their lives. Recorded over eight nights in October 2016, Adam and Anthony strip down songs fans know and love, while also offering new and familiar stories of their lives, careers and friendship. Featuring songs from Memphis, Sweeney Todd, Cabaret, Hedwig and the Angry Inch, Once and much more, Acoustically Speaking is the perfect celebration of two decades of friendship. 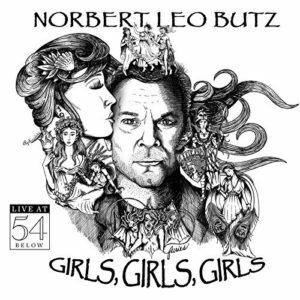 Two-time Tony Award winner Norbert Leo Butz (and star of Netflix’s acclaimed series, Bloodline) has followed up his critically lauded first album Memory & Mayhem–Live at 54 Below with Girls, Girls, Girls (Live at 54 Below), a live album of the show that The New York Times hailed as “brilliantly audacious . . . deeper and richer than any conventional Broadway musical.” Inspired by Greek female deities, the show illustrates the treatment of women in classical myth and contemporary society. The song selections range from Loretta Lynn and Elvis Costello to Hedwig and the Angry Inch and Johnny Cash. Set in the wildest decade ever, Disaster! 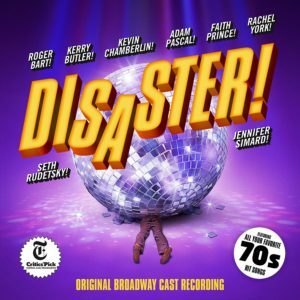 delivered earthquakes, tidal waves, infernos and unforgettable ’70s hits like “Knock on Wood,” “Hooked on a Feeling,” “Sky High,” “I Am Woman” and “Hot Stuff”–plus, and outrageous cast of Tony winners. Audiences and critics went wild for this hilarious homage to the era of bell-bottoms, platform shoes and the hustle. From the moment the glitter ball started spinning, there was dancing in the seats . . . and rolling in the aisles. Jay Armstrong Johnson blew the roof off of Feinstein’s/54 Below with his personal eclectic solo show. Broadway Records has released Jay Armstrong Johnson–Live at Feinstein’s/54 Below, his debut album capturing the electric show, featuring songs from Broadway to radio pop to gospel, with fresh arrangements, a full all-star band, and duets with Todrick Hall, Lindsay Mendez and Billy Lewis Jr. Expect everything from Sondheim to Dixie Chicks. We call it 90 minutes of good times. How else would you explain a PBS special–the first documentary about the television legend– celebrating the career of Norman Lear? Savor American Masters: Norman Lear: Just Another Version of You on Blu-ray and DVD. Enjoyed the special on PBS? Take note that the home releases include more than 12 minutes of bonus features. 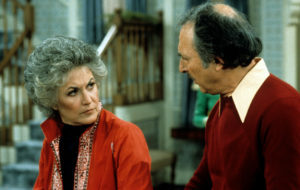 Bea Arthur and Bill Macy in an episode of “Maude”. Largely responsible for the explosion of bold American television in the ’70s, the writer/producer is synonymous with the sitcom. With unprecedented access to Lear, his work and his massive personal archives, the special combines stories from his turbulent childhood and early groundbreaking TV success (think All in the Family, The Jeffersons, Good Times, Maude) and social activism. The documentary also features colorful stories from Lear’s family, friends and collaborators, including John Amos, George Clooney, Alan Horn, Bill Moyers, Rob Reiner, Phil Rosenthal and Russell Simmons, as well as cinéma vérité moments with Mel Brooks, Carl Reiner, Jon Stewart, Amy Poehler and Lena Dunham. 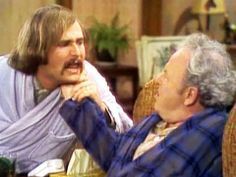 Rob Reiner and Carroll O’Connor bickering (as usual) in “All in the Family”. Breaking down the fourth wall to create an evocative collage where past and present intermingle, Oscar-nominated filmmakers Heidi Ewing and Rachel Grady reveal a psychologically rich man whose extraordinary contributions emerge from both his personal story and his own self-professed childlike view of the world. The documentary traces how a poor Jewish kid from Connecticut started writing for The Colgate Comedy Hour with Dean Martin and Jerry Lewis, created All in the Family and became one of TV’s most successful showrunners. All character-driven, with theatrical sets and live audiences, Lear’s TV series changed not only the face of national television but the content of national discourse. Bringing provocative subjects like war, poverty and prejudice to 120 million viewers every week, Lear proved that social change was possible through an unlikely prism–laughter–and created some of the greatest moments in television history. Co-produced by Ewing and Grady’s Loki Films and THIRTEEN’s American Masters series, Just Another Version of You doesn’t shy away from the controversies Lear stirred with his TV series and advocacy organization People For the American Way (PFAW). The documentary also highlights his later years touring the country with the Declaration of Independence and promoting his memoir Even This I Get to Experience, spending time with his tight-knit family, and developing new productions. Look at this way: Lear can never be stifled. Bob Hope fans rejoice: Been hoping for a spectacular star-studded DVD box set crammed with rarities and thankful memories? You can thank Time Life. 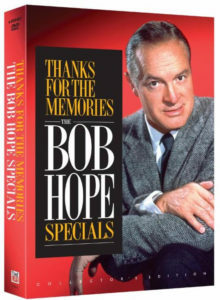 On September 20, they will release Thanks for the Memories: The Bob Hope Specials, a six-disc box set filled with 13 unforgettable comedy-variety specials spanning five decades. The guest stars as a Who’s Who of Great Talent and Major Superstars . . . think Jack Benny, Bing Crosby, Desi Arnaz, Lucille Ball, James Cagney, Tony Bennett, Barbra Streisand, Dean Martin, George Burns, Sammy Davis Jr., Groucho Marx, Don Rickles, John Wayne, Johnny Carson, Presidents Truman, Kennedy and Clinton and many, many more! 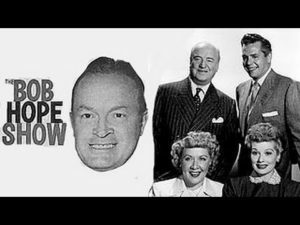 Bob Hope is considered the greatest entertainer of the 20th century. He moved from Broadway to radio to movies to television as easily as a pro golfer sinking a two-foot putt. There was no better showcase for his prodigious talents then his NBC comedy-variety TV specials, which began in 1950 and spanned 50 years and 10 presidential administrations from Harry Truman to Bill Clinton. 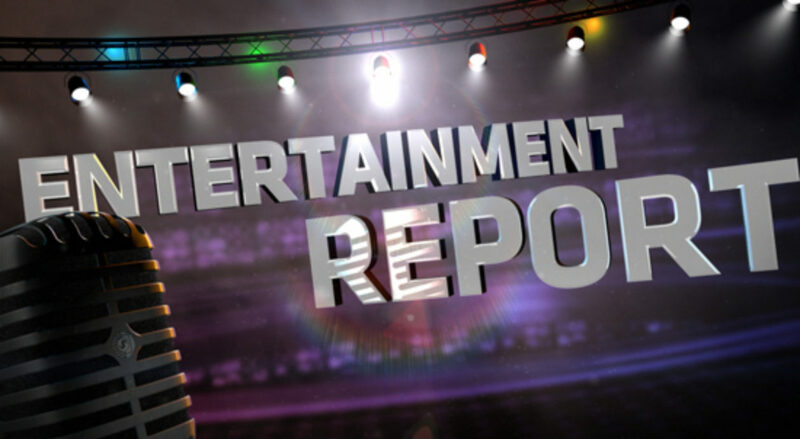 Hope’s hilarious TV specials, many of which are still among the most watched shows of all time, became a vehicle for the stars of the day and defined the variety show for generations of loyal fans. Whether he was ringing in the festive Christmas season with the biggest celebrities in Hollywood, along with major figures from the worlds of sports, music and politics, or bringing a taste of home to servicemen and women scattered thousands of miles from their families with his legendary USO shows, Hope’s warmth and goodwill knew no boundaries. He knew, whether home or abroad, laughter was truly the best medicine. And, for more than 50 years, Hope served it up like no other entertainer in history. Shanks for the Memory The world of golf according to Bob Hope, which includes historic clips of Bob with Bing Crosby, presidents and pros on courses around the world, and special appearances by President Gerald Ford, pro golfers Arnold Palmer, Ben Hogan and Jack Nicklaus.